Fruit Flan – an easy, delicious, and healthy dessert recipe. 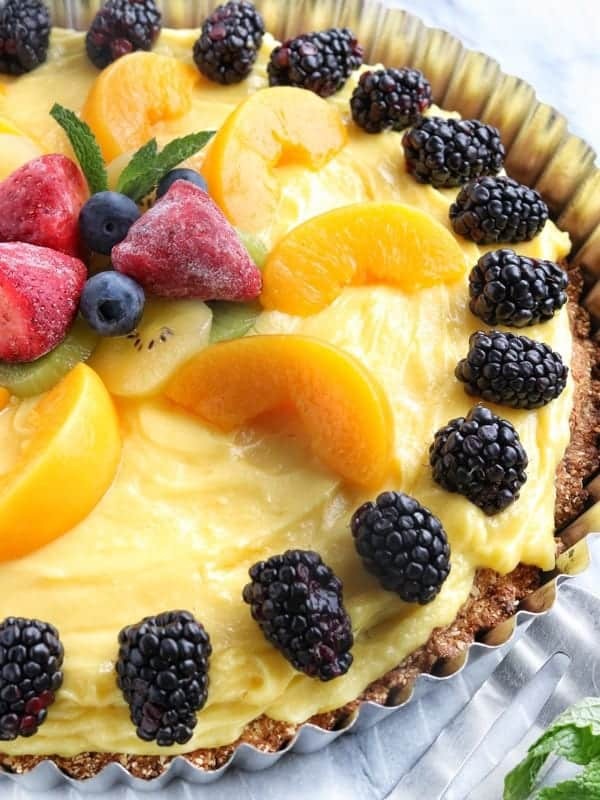 This fruit flan recipe features a flavorful oat crust with a creamy pudding custard filling topped with fresh, frozen, or canned fruit. 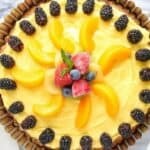 This fruit flan recipe is extremely simple to make & perfect for serving to your family or for a special occasion. Plus, it is delicious & nutritious! 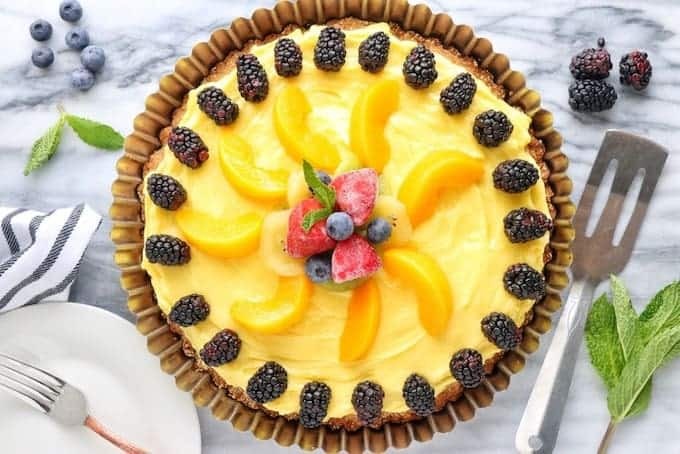 This fruit torte recipe will become one of the top choices the next time you need a healthy fruit dessert recipe. Now you might be wondering if there is a difference between a fruit flan vs fruit tart. There is, in fact, a difference! 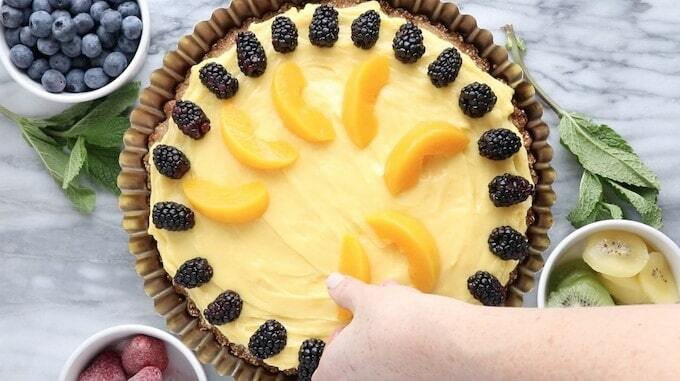 A fruit tart is traditionally made with a crust and cream cheese filling topped with fruit. However, a fruit flan is made with or without a crust and custard filling topped with fruit. 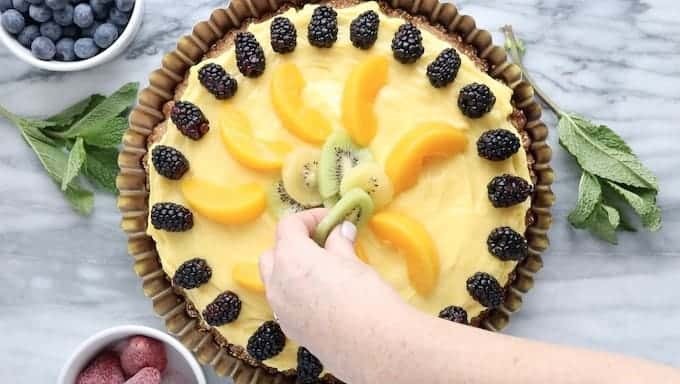 Check out this video for step by step instructions on how to make a fruit flan! Add oats, dates and vanilla extract to a high-speed blender. Blend until pureed. Spray cake pan with non-stick cooking spray. 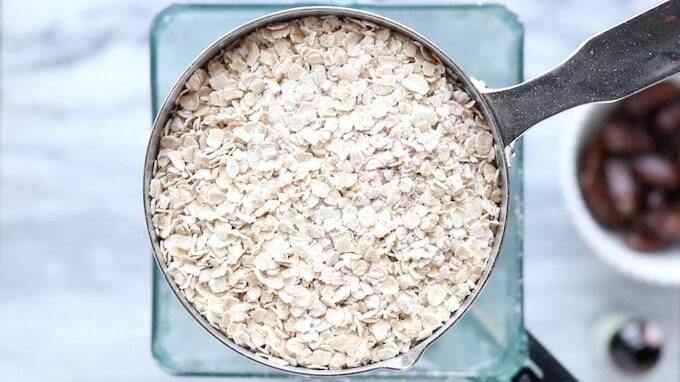 Place oat mixture into the pan and spread into the bottom of the pan, firmly pressing to form a crust. Bake for 10-12 minutes or until browned. Let cool. 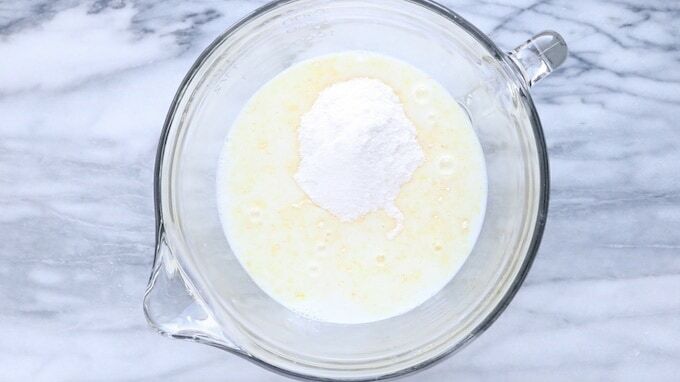 In a medium-sized bowl, whisk yogurt, milk and dry pudding mix. Whisk until firm. Once the crust is cooled, spread pudding mixture on top, spreading until it reaches the edges of the crust. Top with your favorite fruit and serve, or store in the refrigerator until serving. Start by adding oats, dates & vanilla into a blender or food processor. WHAT OATS DO I USE? Between steel cut, old fashioned & instant oats, it can get a bit confusing on which oats to use. Steel Cut Oats – The groats are cut into smaller pieces to create a product that will cook quicker than whole groats. However, this variety still takes the longest to cook compared to rolled or instant oats. This type is best used to add texture to recipes. Try out these delicious Mozzarella-Stuffed Meatballs made with steel cut oats! Old Fashioned Rolled Oats – Groats are steamed and then rolled to create flat flakes to help the product stay fresh longer. Since these oats are flatter, they can absorb more liquid and cook quicker than steel cut oats. This type is best used in baked goods like breads or cookies. Instant/Quick Oats – The groats are steamed longer and rolled thinner than old fashioned oats to create oats that will cook the quickest. 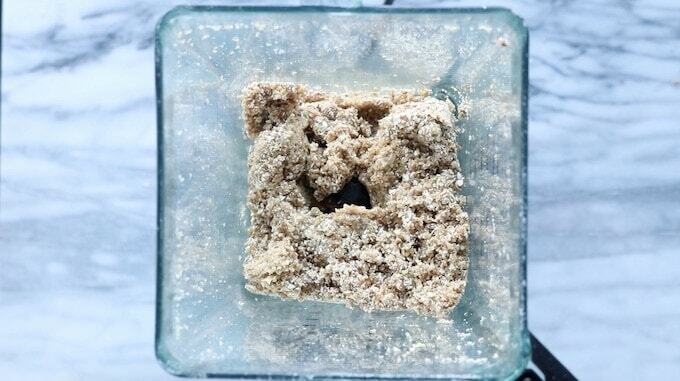 However, instant/quick oats do not add much texture to recipes and are at risk of becoming mushy. NUTRITION TIP: The nutritional value is the SAME for steel cut, old fashioned and instant oats! Next, pulse the ingredients until combined. 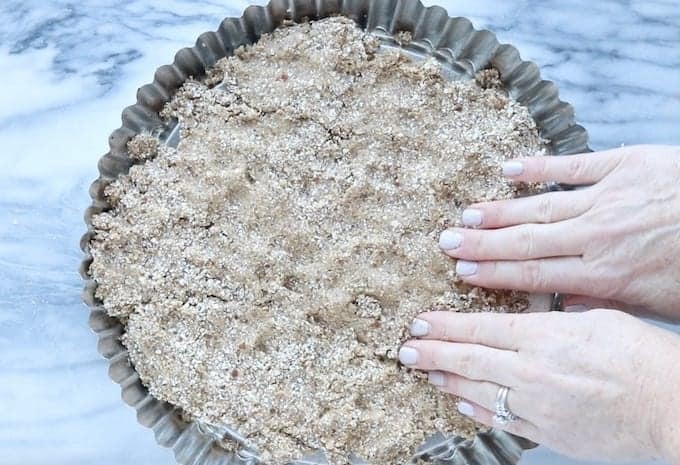 My kids always tell me that they know the crust mixture is ready when it resembles sand, which is a perfect way to know when to stop blending! 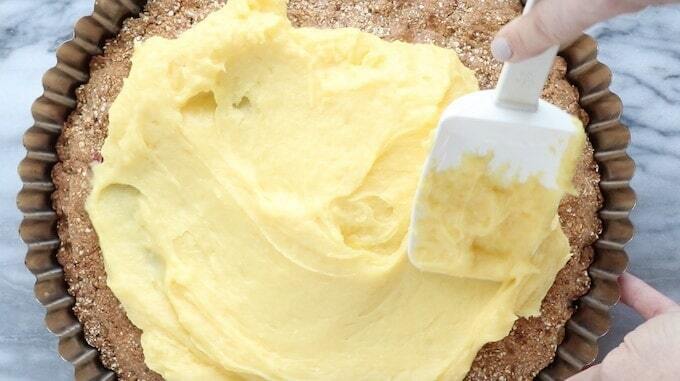 After spraying the cake pan with non-stick spray, gently press the crust mixture into the pan. Once formed into the pie pan, bake for 10-12 minutes or until golden brown. 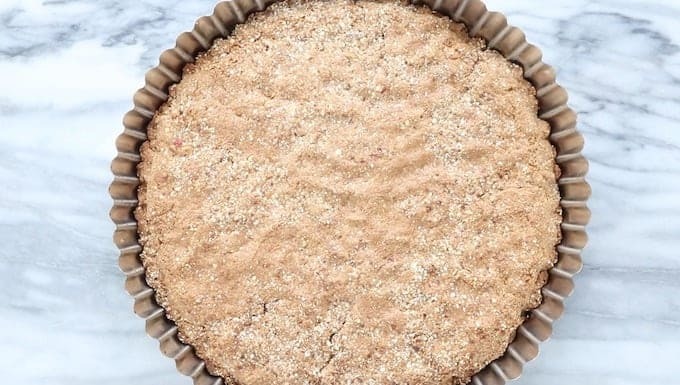 BAKING TIP: When pressing a crust into a pan, make sure it is evenly distributed. Otherwise, some parts of the crust will be overcooked while other parts will be undercooked. DO I HAVE TO USE THIS CRUST RECIPE? There are SO many great crust recipes out there that it can be hard to choose. I picked this crust recipe because the oats, dates & vanilla pair extremely well with the fruit. Plus, dates are a great baking ingredient & I want to use them whenever possible. However, I have swapped this crust with other recipes. 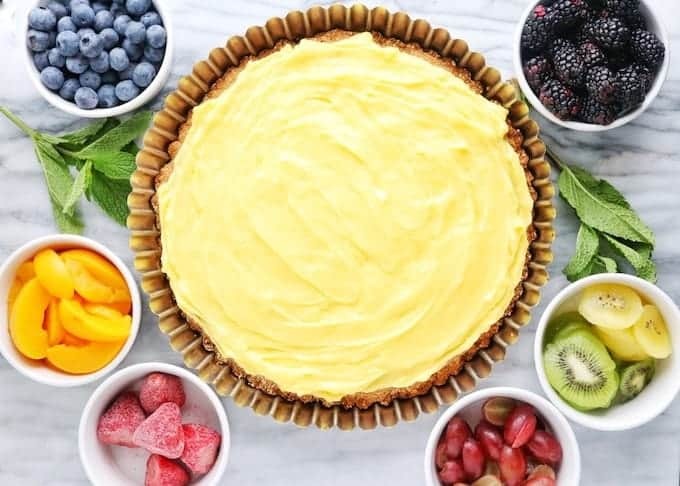 My next favorite option is making a double batch of my sugar cookie Mini Fruit Tart crust to swap for my oat crust, but you can also pastry for fruit flan as well. While the crust is baking, add greek yogurt, milk & dry pudding mix into a bowl. I use a vanilla dry pudding mix but other flavors such as lemon, banana or peach are great substitutions. 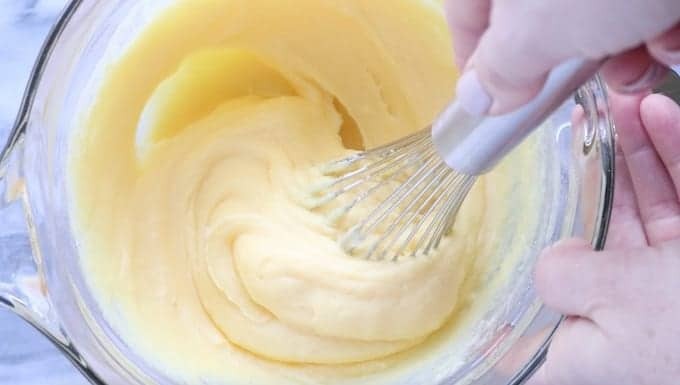 Whisk ingredients together until the pudding custard filling is creamy. Remove the crust from the oven & let it cool. It’s important that the crust is completely cool before adding the custard filling and fruit because otherwise the toppings will melt & you’ll have yourself a mess. While you wait for the crust to cool, find your favorite fresh, frozen or canned fruit. Spread the custard filling onto the crust once it is cool to the touch. I typically place a generous amount of filling in the center of the crust and spread to the edges to eliminate cracking the crust while spreading the custard. Now it is time for my absolute FAVORITE part of the recipe! SHOULD I USE FRESH, FROZEN OR CANNED FRUIT? This recipe is great because you can honestly use whatever fruit you have on hand. I have made this fruit flan with fresh, frozen and canned and all types work. I typically use fresh fruit when possible because I prefer the flavor and bright colors. If I use frozen fruit, I typically defrost the fruit before adding it to my flan. However, I encourage you to try it both ways (frozen vs defrosting) and picking the way that works best for you. Time to add the fruit! In my opinion, this is the best step in the recipe to encourage your kids to get creative. I let my kids take care of the fruit topping and let me tell you – the different patterns & designs that they come up with continue to surprise me. After the design is complete, it is time to serve your masterpiece! I typically cut my fruit flan into pie slices. SERVING TIP: Wait to add the fruit until closer to the serving time to eliminate the fruit juices from leaking into the filling. I store my crust in the fridge until serving time to keep it chilled. I hope you & your family enjoy the fruit flan as much as mine. Be sure to try my Fruit Waffle Cones and Double Chocolate Brownies if you are looking to make healthy kid-friendly dessert recipes! 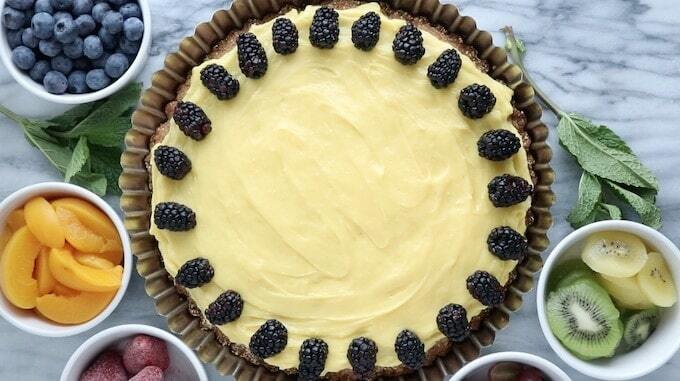 A simple and delicious, healthy dessert recipe. 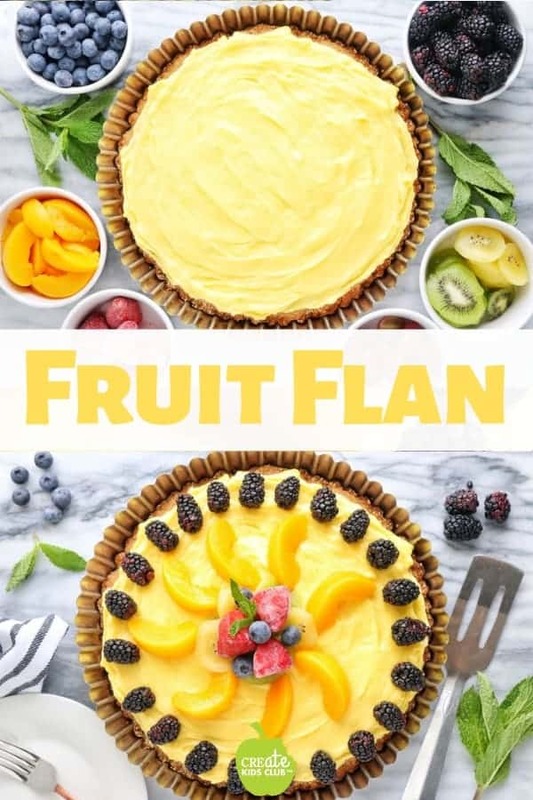 Fruit Flan features an oatmeal crust with a vanilla pudding custard filling topped with fresh, frozen, or canned fruit. 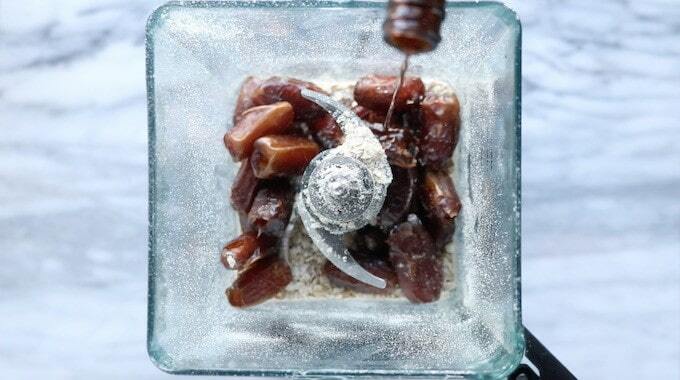 Add oats, dates, and vanilla to high-speed blender. Blend until pureed. 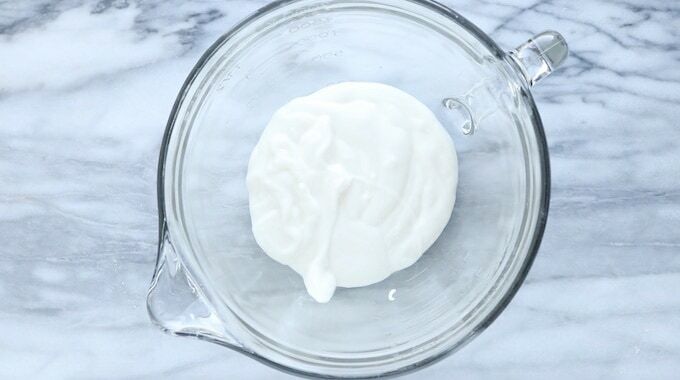 In a medium-sized bowl, whisk yogurt, milk, and dry pudding mix. Whisk until firm. I can’t wait to try this! Thanks for a great gluten free dessert!